Post: Gaurav Akrani. Date: 2/14/2012. Comments (6). Label: Production Planning. 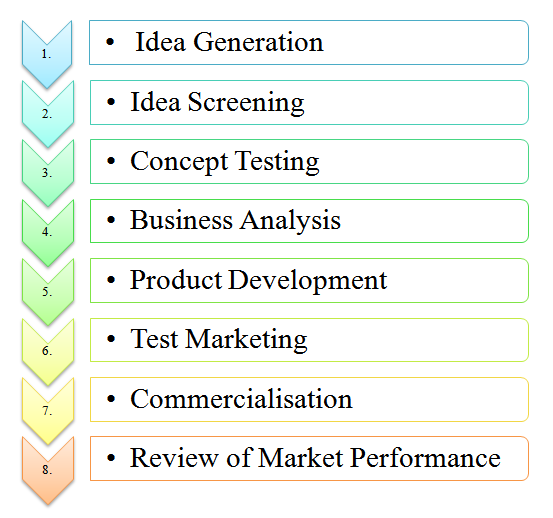 The stages or process or steps involved in a new-product development are depicted in the image given below. Click on it to get a zoomed preview. Now let's discuss each stage in the process of a new-product development. The first step in new-product development is idea generation. Conducting marketing research to find out the consumers' needs and wants. Brainstorming suggestions for new-product ideas. Searching in different markets viz., national and international markets for new-product ideas. Getting feedback from agents or dealers about services offered by competitors. Studying the new products of the competitors. Most companies have a "Idea Committee." This committee studies all the ideas very carefully. They select the good ideas and reject the bad ideas. Is it necessary to introduce a new product? Can the existing plant and machinery produce the new product? Can the existing marketing network sell the new product? When can the new product break even? If the answers to these questions are positive, then the idea of a new-product development is selected else it is rejected. This step is necessary to avoid product failure. Concept testing is done after idea screening. It is different from test marketing. Whether the consumers understand the product idea or not? Whether the consumers need the new product or not? Whether the consumers will accept the product or not? Here, a small group of consumers is selected. They are given full information about the new product. Then they are asked what they feel about the new product. They are asked whether they like the new product or not. So, concept testing is done to find out the consumers' reactions towards the new product. If most of the consumers like the product, then business analysis is done. Business analysis is a very important step in new-product development. Here, a detailed business analysis is done. The company finds out whether the new product is commercially profitable or not. Whether the new product is commercially profitable or not? What will be the cost of the new product? Is there any demand for the new product? Whether this demand is regular or seasonal? Are there any competitors of the new product? How the total sales of the new product be? What will be the expenses on advertising, sales promotion, etc.? How much profit the new product will earn? So, the company studies the new product from the business point of view. If the new product is profitable, it will be accepted else it will be rejected. At this stage, the company has decided to introduce a new product in the market. It will take all the necessary steps to produce and distribute the new product. The production department will make plans to produce the product. The marketing department will make plans to distribute the product. The finance department will provide finance for introducing the new product. The advertising department will plan the advertisements for the new product. However, all this is done as a small scale for Test Marketing. Test marketing means to introduce the new product on a very small scale in a very small market. If the new product is successful in this market, then it is introduced on a large scale. However, if the product fails in the test market, then the company finds out the reasons for its failure. It makes necessary changes in the new product and introduces it again in a small market. If the new product fails again the company will reject it. Test marketing reduces the risk of large-scale marketing. It is a safety device. It is very time-consuming. It must be done especially for costly products. If the test marketing is successful, then the company introduces the new product on a large scale, say all over the country. The company makes a large investment in the new product. It produces and distributes the new product on a huge scale. It advertises the new product on the mass media like TV, Radio, Newspapers, and Magazines, etc. The company must review the marketing performance of the new product. Is the new product accepted by the consumers? Are the demand, sales and profits high? Are the consumers satisfied with the after-sales-service? Are the middlemen happy with their commission? Are the marketing staffs happy with their income from the new product? Is the Marketing manager changing the marketing mix according to the changes in the environment? Are the competitors introducing a similar new product in the market? The company must continuously monitor the performance of the new product. They must make necessary changes in their marketing plans and strategies else the product will fail. The article is very useful.It gives very important information about new product development in very simple and understandable language. Thank you so much.Amol Muley pune.